Her vocabulary is beyond 100 words now, & she's picking up a few a day. She has a theatrical streak. Brontë is always imitating us: brushing her hair, her teeth, blowing on her food, saying thank you (keekyou), wiping her bum if you sit her on the toilet, kissing. 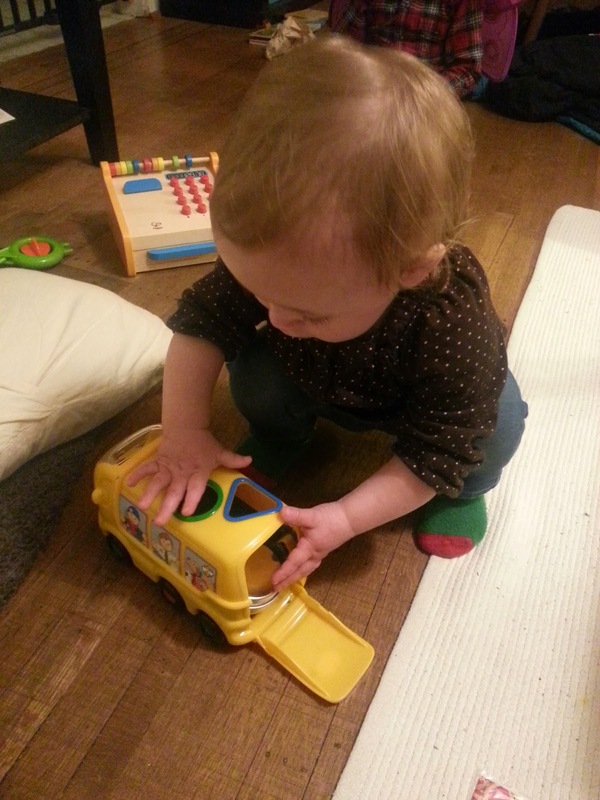 Her favourite toys this month have been her school bus shape sorter, toy screwdrivers, books, & a Playmobil plastic flower. Her favourite game is what I call "grumpy face". She glares at you from under her brows & makes funny faces with her lips. You have to make a grumpy face back until one of you laughs. She likes talking to strangers, & will play grumpy face with people in restaurant. Though she's still throwing food, Brontë seems to have mostly gotten past the throwing things in the toilet phase. She walks really well now. Brontë likes to scribble with crayons. She's still obsessed with pulling keys off laptops, & is now also drawing on them with crayons if she gets a hold of one. Brontë loves peas, warm, cold or even straight out of the freezer. She has nine teeth fully in & four more that have broken through the gums a bit. When she wants to breastfeed, Bronte will climb in my lap, pull at my shirt & say "shirt", "noms", "milk", or "mine!" She still usually breastfeeds a couple times during the night--once when I go to bed & once in the early morning. Brontë is definitely a creature of habit. She always gets tired by about 8pm, wakes up around 8am, & likes to nap at 1 or 1:30pm. She is probably the loudest child I know. I'm not sure how someone that's barely 24 pounds can make sounds THAT loud.